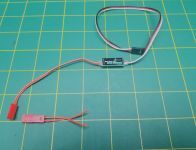 RCM V2 Telemetry Device for Boats, Cars and Airplanes. GPS measures speed and location on your Android device in real time. Includes 3 sensors that you can attach to any three items you want to measure the temperature of. Most times this will be valuable for measuring motor, esc and battery temps. Shows the vehicle on a vitual map to see where you have been. A course can be marked and plotted out in the app to view the boat/vehicle travel around a course. NEW - Measures brushless rpm or gas motor rpm with optional rpm sensor. 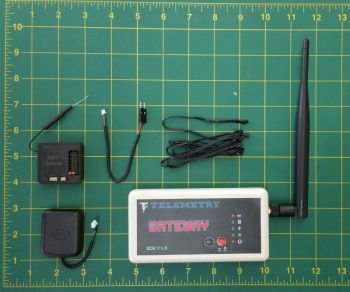 NEW - Comes with either a 100mm (3.9") or 300mm (11.75") long antenna. (1) Power wire that plus into the balance tap of your lip pack. Customer to supply method to attach sensors to items. Velcro straps, tape or elastics are some ways to do this. Click here to download the APP. NOTE: Click while viewing this page from your andriod device. Some Andriod devices include a APP installer, if not you can download one for free from the Andriod Play Store.